Towards the end of last month, ASL accomplished a feat they said couldn’t be done. We were on location and provided video production crews for five shoots, in five different cities, all in one day. You heard (read) us correctly. 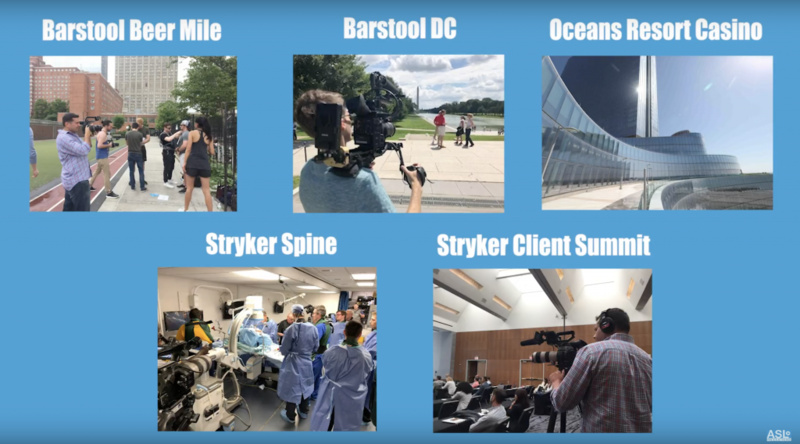 We had two shoots with Barstool Sports in DC and New York, one shoot with William Hill Sports Book at Ocean’s Casino in Atlantic City and two shoots with Stryker Spine in Allendale and Hoboken. Our ability to produce and crew each shoot speaks to our versatility and the depth of our production network. We made a video recapping our day that you can check out here, but the inside scoop is below. Our first shoot of the day was for Barstool Sports. Adam and our intern, Rebecca, filmed the Barstool team attempting to run a mile while intermittently chugging beer, The Beer Mile. This spectacle also doubled as a promotion for, shoe and apparel company, Puma. We filmed a wide angle that captured the whole event and close-up coverage of each racer, the beer chugging, the interactions between the runners, and one of the runners throwing up on the side of the track. It was a very light-hearted and fun shoot, but we couldn’t stay long — we had a pharmaceutical video production to get to! So, we packed up our things and drove to Hoboken, NJ for our second shoot of the day. We raced over to Hoboken for our medical production for Stryker Spine at the W Hotel. 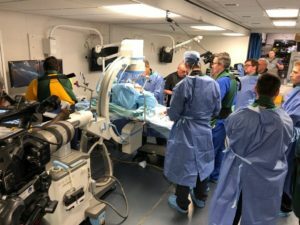 We filmed the corporate conference where the attendees discussed how Stryker Spine can extend their brand reach and specifically target doctors training to be spine specialists. The conference participants broke into groups to discuss these topics. Afterwards, the groups presented their observations, discoveries, and potential solutions to everyone in attendance. We filmed these presentations, creating a record of the information they gained throughout the day. Stryker makes sure they get their facts, along with their spines, straight! the doctors gave feedback to the sales people and marketers. We got a variety of wide and close-up shots of the lab, including inside the cadaver. It was an interesting shoot, to say the least, but as always, ASL gave our entire mind, BODY, and soul to our clients. At the same time, down the coast in Atlantic City, ASL sent a field producer/editor and a camera operator to film and quickly edit a promotional video for the opening of the William Hill Sports Book at Oceans Casino. We also recently filmed the opening of the William Hill Sports Book at Monmouth Race Park and as sports betting is becoming legal on the east coast, we imagine we will be sending video production crews to more and more of these events. For the AC opening Mark Wahlberg and Jamie Foxx were there to make the first bet and open the sports book with a celebrity bang! Our last shot of the day, like our first shoot of the day, was for Barstool Sports. This time, we were in Washington DC filming the Travel Show with Caleb and Rone. We captured them talking to people in the street, dining at famous DC eateries and visiting national monuments. It was a shoot based in history, knowledge and outright silliness. Never the less, our production team got it done even though we were laughing the entire time. Thus, the recap of our “FIVE SHOOTS in FIVE CITIES in ONE DAY” day. It was a long, busy and intense day. We had to hustle and maintain ultimate focus. After a day like this, one shoot in one day for your company, will be a piece of cake! Contact us today for any, and all, of your video needs. And remember #LoveYourContent!